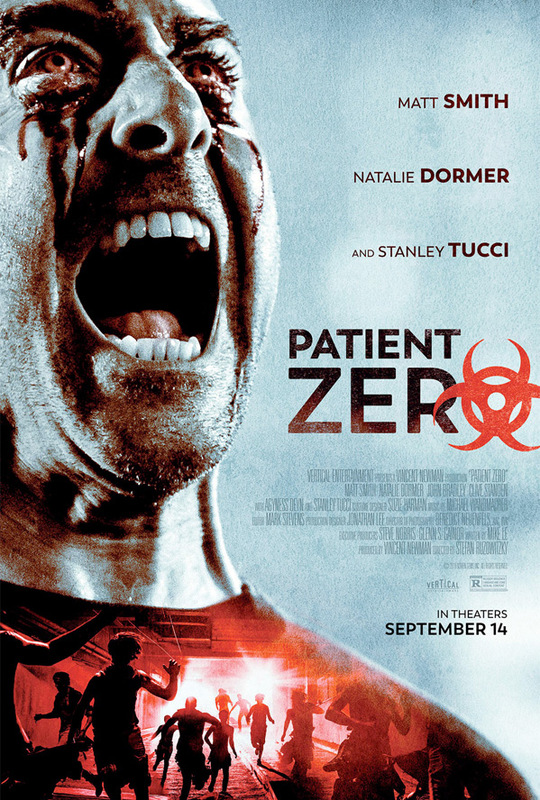 "Something new and smart is evolving…" Sony has debuted the trailer for an indie horror thriller titled Patient Zero, another attempt at mixing up the zombie genre with new ideas. The twist in this one is that one guy has the unique ability to speak "the Infected's new language" and leads the last survivors on a hunt for Patient Zero and a cure. Matt Smith stars as Morgan, the one with the skill of communicating with the undead/zombie/creatures but goes up against a formidable opponent when they find The Professor, played by Stanley Tucci. The cast includes Natalie Dormer, Clive Standen, Agyness Deyn, John Bradley, Colin McFarlane, Pippa Bennett-Warner, and James Northcote. As interesting as this "pandemic" film seems, there's so much of the usual tropes in this it doesn't seem like it really has anything new to offer. In this new pandemic thriller, humanity is battling intelligent, adrenaline-fueled creatures born from a viral super-strain. After being bitten, human survivor Morgan (Matt Smith) realizes he is asymptomatic and can communicate with the infected, leading the last survivors on a hunt for Patient Zero and a cure. Patient Zero is directed by award-winning Austrian filmmaker Stefan Ruzowitzky, director of the films Tempo, The Inheritors, Anatomy 1 & 2, All the Queen's Men, The Counterfeiters, Lilly the Witch: The Dragon and the Magic Book, Deadfall, and Cold Hell previously. The screenplay is written by Mike Le. This hasn't premiered at any film festivals or otherwise yet. Sony Pictures will release Ruzowitzky's Patient Zero in select theaters on September 14th, following the VOD release on August 14th next month. Interested?